It has been known for decades (1) that chronic sclerosing lesions of glomeruli and renal interstitium tend to progress with time, even if the primary insult is no longer operative. Similar progression has also been noted in patients with chronic renal disease (2). Recently, the concept has been proposed that even advanced glomerular lesions are potentially reversible, pointing to the potential of glomerular remodeling. This has also been shown in patients with diabetic nephropathy who had undergone pancreatic transplantation (3). Less definite evidence has also been provided in IgA glomerulonephritis as an example of nondiabetic renal disease (4). 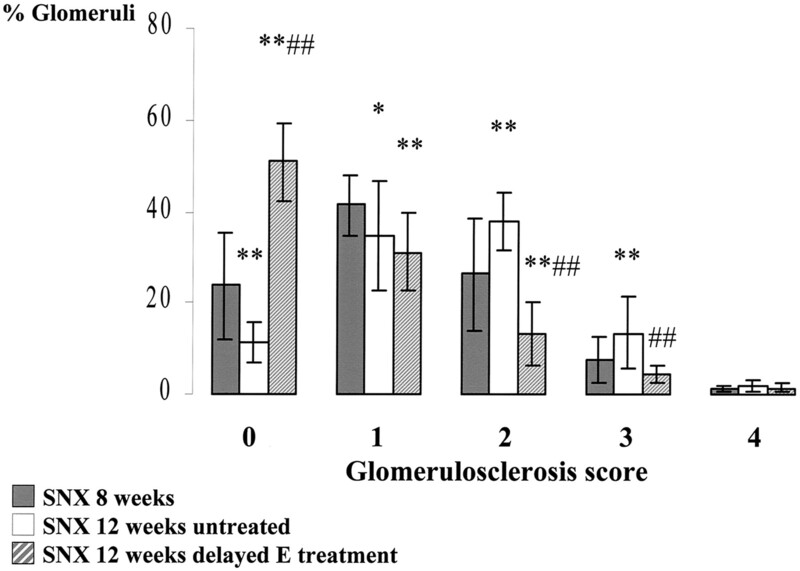 Animal experiments argue strongly for reversibility of focal segmental glomerulosclerosis. In subtotally nephrectomized rats receiving high doses of angiotensin-converting enzyme (ACE) inhibitors or angiotensin receptor blockers and sequentially followed with repetitive renal biopsies, regression of glomerular lesions has been clearly documented (5,6⇓). It was the purpose of the present study to confirm that ACE inhibitors cause reversal of glomerulosclerosis in the subtotally nephrectomized rat and to extend past observations by providing information on glomerular volume, podocytes, cells within the mesangium, and endothelial cells as well as on vessels and tubulointerstitial space. To this end, after pressure-controlled perfusion fixation we compared the kidneys of animals left untreated for 8 wk and of animals followed for additional 4 wk and either given high doses of enalapril or no treatment. Male Sprague Dawley rats (Charles River Co, Sulzfeld, Germany), mean body weight 378 ± 16 g, were housed at constant room temperature (21°C) and humidity (75%) and exposed to a 12 h light on, 12 h light off cycle. The animals had free access to water. The rats were fed pellets (23.4% protein, 4.5% fat, 6% fiber, 0.40% sodium; Altromin/Lage/Lippe, Germany). After a 7-d adaptation period, rats were randomly allotted to subtotal nephrectomy (SNX) (n = 27) or sham operation (n = 31) and subsequently fed using a pair-feeding protocol. As described before (7) the rats underwent two-step subtotal nephrectomy (removal of right kidney; 7 days later, weight-controlled surgical removal of cortical tissue of the hypertrophied left kidney corresponding to 66% of the weight of the right kidney). Eight weeks after the second operation, one group of rats was killed. The remaining animals were randomly allotted to two arms: no treatment or enalapril (Berlin Chemie, Germany) treatment (48 mg/kg body wt per day) by adding enalapril to the drinking fluid at concentrations calculated to deliver the above-mentioned dose for 4 wk. Daily food and water consumption were monitored, and the doses were adjusted. Enalapril dose used in the current study exceed 4 times antihypertensive dose and was chosen according to the results of Ikoma et al. (5). This study shows that in subtotally nephrectomized rats treatment with high doses (48 mg/kg body wt per day) of enalapril but not lower dose (12 mg/kg body wt per day) leads to the regression of glomerular lesions, which were documented by repetitive renal biopsies (5). Body weight and BP (by tail plethysmography) were measured at regular intervals. After 7 and 12 wk animals were kept in metabolic cages for 24-h urine collection. Urinary albumin excretion was measured using a rat-specific sandwich ELISA system using the microplate technique and a rabbit anti-rat albumin peroxidase conjugate as described in detail elsewhere (8). Eight or twelve weeks after surgery blood samples were taken, and the experiment was terminated by retrograde aortic perfusion with glutaraldehyde for morphometric and stereological investigations. Perfusion pressure was kept at 120 mmHg. Adequacy of fixation was examined in pilot experiments. The kidneys were weighed and dissected in a plane perpendicular to the interpolar axis, yielding slices of 1-mm width. Ten small pieces of one kidney were selected by area weighted sampling for embedding in Epon-Araldite. Tissue slices were also embedded in paraffin; 4-μm sections were prepared and stained with PAS. Five of the resin blocks were randomly chosen, from which semithin sections (0.5 μm) were prepared and stained with PAS. The kidneys were subsequently investigated by means of morphometry and stereology (9,10⇓). Indices of Renal Damage (Glomerulosclerosis, Tubulointerstitial, and Vascular Damage). All semiquantitative, morphometric, and stereologic investigations were performed in a blinded manner by an observer who was unaware of the study protocol. The degree of sclerosis within the glomerular tuft as an index of progression was determined on PAS-stained paraffin sections, adopting the semiquantitative scoring system proposed by El Nahas et al. (11). Using light microscopy at a magnification of ×400 the glomerular score of each animal was derived as the mean of 100 glomeruli. The severity of glomerulosclerosis was expressed on a scale from 0 to 4 (11). The glomerular score for individual glomeruli was: grade 0, normal glomerulus; grade 1, beginning mesangial expansion/thickening of the basement membrane and/or irregular lumina of capillaries; grade 2, mild/moderate segmental hyalinosis/sclerosis involving less than 50% of the glomerular tuft; grade 3, diffuse glomerular hyalinosis/sclerosis involving more than 50% of the tuft; grade 4, diffuse glomerulosclerosis with total tuft obliteration and collapse. The resulting index in each animal was expressed as a mean of all scores obtained. Tubulointerstitial and vascular damage was assessed on PAS-stained paraffin sections at a magnification of ×100 using a similar scoring systems (12). For determination of the tubulointerstitial damage score, ten fields per kidney were randomly sampled and the changes (0–4) were graded as follows: grade 0, no change; grade 1, lesions involving less than 25% of the area; grade 2, lesions affecting 25 to 50%; grade 3, lesions involving more than 50%; grade 4, involving (almost) the entire area. Similarly, for the vascular damage score, the following scheme was adopted: grade 0, no wall thickening; grade 1, mild wall thickening; grade 2, moderate wall thickening; grade 3, severe wall thickening; grade 4, fibrinoid necrosis of the vascular wall. Area (AA) and volume density (VV) of the renal cortex and medulla as well as the number of glomeruli per area (NA) were measured using a Zeiss eyepiece (Integrationsplatte II; Zeiss Co., Oberkochen, Germany) and the point counting method (PP = AA = VV) at a magnification of ×400. All glomeruli on one H&E section were counted to calculate glomerular volume density, area density, and tuft volume. This H&E section represents several equidistant slices of the kidney and gives thus a representative sample of all kidney areas. The number of glomeruli per area (NA) was then corrected for tissue shrinkage (1.082). Total cortex volume (Vcortex) was derived from kidney mass divided by specific weight of the kidney (1.04 g/cm3) times the volume density of the cortex. Glomerular geometry was analyzed as follows: Volume density (VV) of glomeruli and tubulointerstitium as well as the area density of the glomerular tuft (AAT) were measured by point counting according to PP = AA = VV at a magnification of ×400 on the entire HE sections. The total area of the glomerular tuft (AT) was then determined as AT = AAT × Acortex. The number of glomeruli per volume (NV) was derived from the glomerular area density (NA) and the volume density (VV) of glomeruli using the formula: NV = k/β × NA(1.5)/VV(0.5) with k = 1.1 (size distribution coefficient) and β = 1.382 (shape coefficient for spheres). The total number of glomeruli was calculated from the total volume of the renal cortex and the number of glomeruli per cortex volume: Nglom = NV × VCortex. The mean glomerular tuft volume was determined according to v = β/k × AT(1.5) with β = 1.382 and k = 1.1 (13). Analysis of Glomerular Capillarization and Cellularity on Semithin Sections. On five semithin sections per animal, glomerular capillarization and cellularity were analyzed using the point counting method and a 100 point eyepiece (Integrationsplatte II; Zeiss Co.) at a magnification of ×1000 (oil immersion) as described previously (13). Briefly, the length density (LV) of glomerular capillaries was determined according to the standard stereological formula, LV = 2QA (with QA being the number of capillary transects per area of the capillary tuft) (13,14⇓). The total length of glomerular capillaries per one kidney (Ltotal) was then derived from LV and the total glomerular volume (Vglom) with Vglom = VVglom × Vcortex (13). Glomerular cells (podocytes, cells within the mesangium, and endothelial cells) were assessed by stereological techniques in at least 30 randomly selected glomeruli per animal from cell density per volume (NcV) and volume density of the cell type (VcV) according to this equation: NcV = k/β × NcA(1.5)/VcV(0.5) with β for podocytes = 1.5 and for cells within the mesangium and endothelial cells = 1.4 and k = 1 (12,13⇓). However, it should be mentioned that in this study based on morphologic criteria, we were not able to distinguish between resident mesangial cells and infiltrating mononuclear cells. Data are given as mean ± SD. Kruskal-Wallis test or ANOVA was used, followed by Duncan multiple range test or Sheffé test. Intraindividual changes of systolic BP and albumin excretion rate were analyzed using the Mann Whitney U test. The results were considered significant when P < 0.05. As shown in Table 1, baseline and final body weight were comparable in all groups. The weight of the left (remnant) kidney was significantly higher in SNX compared with sham-operated controls. The weight of the remnant kidney tended to be lower in animals with delayed enalapril treatment compared with untreated animals, but the difference was significant only for the comparison of SNX 12 wk delayed enalapril treatment versus SNX 8 wk untreated. Plasma, urea, and creatinine concentrations were significantly higher in all SNX groups when compared with the corresponding sham-operated groups (Table 1). The hemoglobin concentration was significantly lower only in SNX 12 wk with delayed enalapril treatment. BP values were significantly lower in sham-operated compared with SNX animals. In animals sacrificed after 8 wk, systolic BP was 122 ± 9 mmHg in sham-operated controls and 155 ± 26 mmHg in SNX animals. Delayed enalapril treatment caused a significant decrease of systolic BP both in sham-operated controls and SNX animals. At 12 wk, the BP values in the four different groups were significantly (P < 0.001) different (Figure 1). At the end of the experiment, BP was 127 ± 11 mmHg in untreated sham-operated controls, 102 ± 11 mmHg in enalapril-treated sham-operated controls, 154 ± 16 mmHg in untreated SNX, and 116 ± 14 mmHg in enalapril-treated SNX. Figure 1. Systolic BP during the experiment. * P < 0.05 versus 7 wk after surgery (before enalapril treatment); § P < 0.05 versus respective group of sham-operated rats. Seven weeks after surgery, the urinary albumin excretion rate was significantly higher in SNX compared with sham-operated controls (Figure 2). At the end of the 12-wk experiment, the urinary albumin excretion rate was 0.47 ± 0.37 mg/24 h in untreated sham-operated controls, 0.62 ± 0.33 mg/24 h in enalapril-treated sham-operated controls, 7.28 ± 2.22 mg/24 h in SNX untreated, and SNX 4.85 ± 3.40 mg/24 h in enalapril-treated. Figure 2. Urinary albumin excretion during the experiment. * P < 0.05 versus 7 wk after surgery (before enalapril treatment); § P < 0.05 versus respective group of sham-operated rats. As shown in Table 2, the indices of glomerulosclerosis (GSI), tubulointerstitial (TII), and vascular (VI) damage were significantly higher in all SNX groups when compared with sham-operated controls. At the end of the experiment (12 wk after SNX) GSI, TII, and VI were significantly lower in SNX with delayed enalapril treatment compared with untreated SNX. GSI, TII, and VI in SNX with delayed enalapril treatment were also significantly lower than in untreated SNX at 8 wk, suggesting improvement of these indices. The individual values of GSI the individual animals are plotted in Figure 3. Figure 3. Individual values and means of the glomerulosclerosis index. 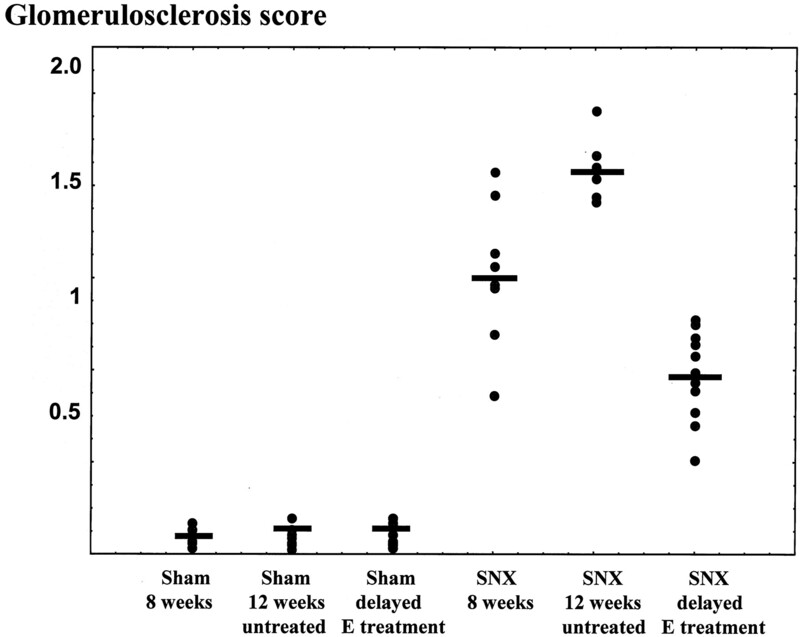 As shown in Figure 4, most of glomeruli were in 1 (41.3%) and 2 (26.2%) glomerulosclerosis score at 8 wk after SNX. After 12 wk, untreated SNX 12 were characterized by a progressive increase of incidence of sclerotic glomeruli. The percentage of glomeruli in 2 and 3 glomerulosclerosis score were significantly higher in untreated rats at 12 wk after SNX than in rats at 8 wk after SNX (37.9% versus 26.2% and 13.5% versus 7.5%, respectively). Comparison of the incidence of sclerotic glomeruli between treated and untreated SNX rats 12 wk after SNX showed that the percentage of sclerosed glomeruli (score 2 and 3) was significantly lower in SNX after delayed enalapril treatment (37.9% versus 13.3% and 13.5% versus 4.2%, respectively). The incidence of sclerotic glomeruli in score 2 were significantly lower and tended to be lower (P = 0.05) in score 3 in SNX with delayed enalapril treatment than in untreated SNX at 8 wk (13.3% versus 26.2% and 4.2% versus 7.5%, respectively) suggesting that regression of glomerulosclerosis occurred. Figure 4. Incidence of glomerulosclerosis in SNX 8 wk, SNX 12 wk untreated, and SNX at 12 wk after 4 wk of delayed enalapril treatment. * P < 0.05 versus SNX 8 wk, ** P < 0.01 versus SNX 8 wk; # P < 0.05 versus SNX 12 wk untreated; ## P < 0.01 versus SNX 12 wk untreated. The total number of glomeruli per left kidney was reduced from an average of 45,300 to an average of 15,300 after SNX, with very little variance among the three SNX groups, documenting that reduction of nephron numbers had been precise with little interindividual variation. Comparison of the glomerular volume shows significantly smaller glomerular volume in SNX after delayed enalapril treatment compared with untreated SNX at 12 wk. While the glomerular volume in untreated SNX at 12 wk tended to be higher than in untreated SNX at 8 wk (difference not statistically significant), it was significantly less in SNX with delayed enalapril treatment at 12 wk compared with untreated SNX at 8 wk, suggesting reduction of glomerular volume. SNX did not differ significantly from sham-operated controls with respect to the mean number of podocytes per glomerulus (Table 3). Mean podocyte volume was significantly higher in SNX compared with sham-operated controls, indicating hypertrophy of podocytes during glomerular enlargement and glomerulosclerosis. The podocyte volume was significantly higher in SNX sacrificed after 12 wk, both treated and untreated, than in untreated SNX at 8 wk. Untreated SNX at 12 wk and SNX with delayed enalapril treatment at 12 wk did not differ with respect to mean podocyte volume (Table 3). The mean number of cells within the mesangium per glomerulus was significantly higher in all SNX groups compared with sham-operated controls (Table 3). Comparison of the mean number of cells within the mesangium per glomerulus showed significantly lower numbers of mesangial cells in SNX after delayed enalapril treatment compared with untreated SNX at 12 wk. The number of cells within the mesangium per glomerulus in SNX after delayed enalapril treatment was similar to that of untreated SNX at 8 wk. SNX did not differ significantly from sham-operated controls with respect to the mean volume of cells localized in the mesangium (Table 3). The mean number of endothelial cells per glomerulus was significantly higher in untreated SNX at 8 and 12 wk compared with sham-operated controls (Table 3). Comparison of the number of endothelial cells per glomerulus showed significantly lower number of endothelial cells per glomerulus in SNX after delayed enalapril treatment compared with untreated SNX at 12 wk. The number of endothelial cells per glomerulus in SNX after delayed enalapril treatment was significantly lower than both in untreated SNX at 8 and 12 wk, and it did not differ significantly from sham-operated controls. The mean endothelial cell volume tended to be higher in SNX groups compared with sham-operated controls (Table 3). The length density of glomerular capillaries, a marker of capillary obliteration, was significantly lower in all group of SNX compared to sham-operated controls (Table 4). The same was true for the total capillary length per kidney (Table 4). SNX did not differ significantly from sham-operated controls with respect to fractional glomerular capillary tuft volume. As shown in Table 4, fractional mesangial matrix volume was significantly higher in all SNX groups when compared with sham-operated controls. At the end of the experiment, 12 wk after SNX, fractional mesangial matrix volume was significantly lower in SNX with delayed enalapril treatment compared with untreated SNX. Mesangial matrix volume was also significantly lower in SNX with delayed enalapril treatment compared with untreated SNX at 8 wk, suggesting partial resolution of preexisting matrix accumulation. Figure 5 gives the typical glomerular morphology in a sham-operated animal and in a SNX animal at 8 wk as well as an untreated SNX animal at 12 wk and a SNX animal at 12 wk after delayed enalapril treatment for 4 wk. Figure 5. Morphology in a sham-operated animal (A), SNX 8 wk (B), SNX 12 wk untreated (C), and SNX at 12 wk after 4 wk of delayed enalapril treatment (D). The present study adds further weight to the recent concept of reversal of glomerular injury by glomerular remodeling (5,6⇓). It confirms the results of Ikoma et al. (5) and of Nakamura et al. (6), who had used a different experimental and methodological approach. It further documents that remodeling concerns not only the glomerulus, but also the vascular and tubulointerstitial compartments. Finally, it provides quantitative information on the cellular composition and structural parameters of the glomerulus after such remodeling has taken place. Previous studies (5,6⇓) had used repetitive renal biopsies to document reversal of glomerulosclerosis. This technique is demanding and provides small samples, preventing more-detailed, biostatistically firm analysis of glomerular cell analysis as well as of tubulointerstitial and vascular lesions. It also entails the risk of sampling error. We therefore adopted a different approach, i.e., leaving animals untreated for 8 wk and then introducing delayed treatment with enalapril. The results are in complete agreement with the previous papers (5,6⇓). As a spin off, since we could use pressure-controlled perfusion fixation, quantitative stereological data could be obtained in the present study, which allowed assessment of glomerular geometry and cell composition. We acknowledge the potential drawback of our protocol, i.e., that we do not have intraindividual comparisons in the absence of serial renal biopsies (5,6⇓). We do not feel that this is of great concern; the differences between delayed enalapril treatment and continued lack of treatment were quite dramatic (Table 2). A further strong point of the present methodology of subtotal nephrectomy is the fact that the amount of tissue and the number of glomeruli removed were carefully controlled and absolutely identical within narrow limits (Table 2) so that renal damage was well standardized. The present study documents that reversal similar to that obtained for angiotensin receptor blockers can be obtained with ACE inhibitors (6); however, we cannot exclude minor quantitative differences between the two classes of agents because a head-on comparison has not been performed. One particularly interesting finding in the present study was the rapid reduction of glomerular volume. This cannot be a perfusion artifact, because the perfusion was carried out at a carefully controlled uniform perfusion pressure of 120 mmHg. Comparison of glomerular volume at weeks 8 and 12 shows that there was an actual decrease of volume and not attenuation of glomerular enlargement. Advanced glomerulosclerosis tends to cause shrinkage of the tuft volume and of glomerular volume. However, it was previously shown by Yoshida et al. (15) that in an earlier phase of glomerulosclerosis (i.e., up to 50% of the tuft involved), as it is in case in the current study, a positive correlation is found between glomerulosclerosis index and glomerular volume. We emphasize that, despite a progressive increase of the glomerular sclerosis index in these animals, the glomerular volume tended to increase further in the untreated SNX, while it decreased significantly in enalapril-treated animals. These changes in glomerular geometry provide further support for the concept (5) that true remodeling has taken place. Podocytes are thought to play a pivotal role in the development of glomerular scarring (16). In agreement with previous reports, the number of podocytes in the present study did not increase in parallel with glomerular volume, in contrast to the numbers of mesangial and endothelial cells. This observation is in line with the concept that podocytes are postmitotic cells. After SNX, we found a marked progressive increase of podocyte volume, more pronounced at 12 than at 8 wk. Interestingly, delayed enalapril treatment had no effect on either podocyte number or volume. In contrast, the number of cells within the mesangium was increased after SNX, and the increase was progressive with time, i.e., the number was higher at 12 wk than at 8 wk after SNX. Delayed enalapril treatment, started 8 wk after SNX, completely prevented the further increased numbers of cells within the mesangium. In agreement with past observations (13), SNX did not affect volume of cells within the mesangium. It should be mentioned that in this study, which was based on morphologic criteria, we were not able to distinguish between resident mesangial cells and infiltrating mononuclear cells. The number of endothelial cells increased after SNX. This increase probably reflects compensatory capillary growth in glomeruli undergoing hypertrophy. Delayed enalapril treatment reduced and even normalized the number of endothelial cells after SNX. In cell cultures, angiotensin II stimulated the proliferation of glomerular mesangial and endothelial cells (17). Therefore in this study the decreased number of endothelial cells and cells within the mesangium after high-dose enalapril treatment is presumably due to effective blockade of the RAS. On the other hand, one might speculate that when the scarring of glomeruli has stopped, when glomerular volume has decreased and when lesions have been resolved, there is no more need for compensatory capillary growth. So that the number of endothelial cells can decrease. As was shown previously (18), the endothelial cell volume was increased significantly 12 wk after SNX and this was not influenced by delayed enalapril treatment. Detailed structural analysis of glomerulus showed that capillary density and capillary length per kidney were significantly reduced after SNX, presumably reflecting capillary occlusion and/or poor capillary growth, inadequate in relation to glomerular enlargement. Delayed short-term enalapril treatment had no impact on these structural capillary abnormalities. We observed significantly increased mesangial matrix volume after SNX. Enalapril treatment led to partial resolution of excess mesangial matrix. This observation is in line with the concept that by reducing plasminogen activation inhibitor (PAI-1) activity (which inhibits not only fibrinolysis, but also proteolysis), ACE inhibitor treatment increases proteolytic activity in injured glomeruli, permitting enhanced matrix degradation (5). It has been strongly argued (19) that tubulointerstitial lesions are not simply a passive reflection of glomerular injury, but primary abnormalities that are highly correlated to the progressive loss of renal function. Against this background, it is important to emphasize that delayed enalapril treatment compared with continued lack of treatment had a marked effect of indices of tubulointerstitial damage. Similar changes of the vascular damage index were also seen. This observation suggests that remodeling takes also place in the tubulointerstitial and vascular compartments. The pace at which remodeling takes place in the kidney (i.e., within 4 wk) is quite amazing. However, Mizuno-Horikawa et al. 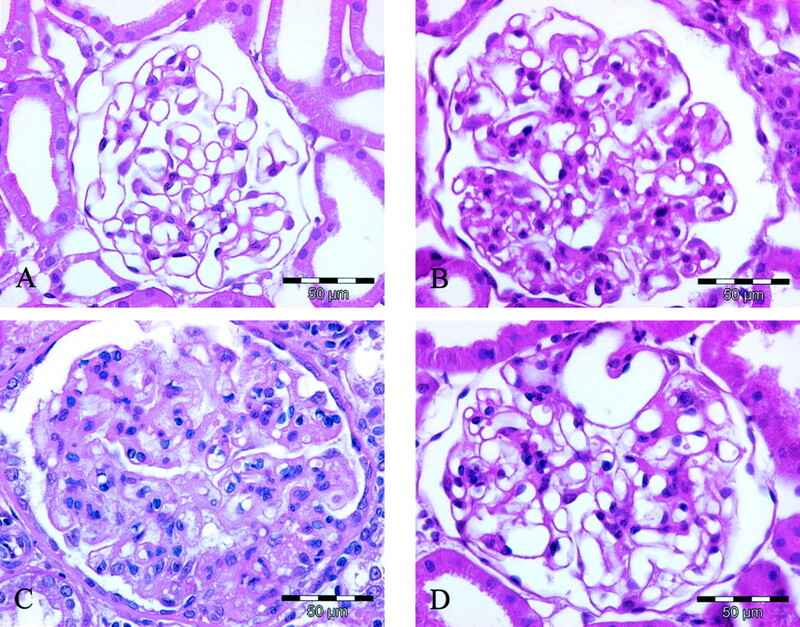 (20) recently observed marked regression of glomerulosclerosis in nephrotic nep/nep mice 7 d after reduction of glomerular filtration due to ureteral ligation. Against this background, we emphasize that a similarly fast reversal of established lesions was not noted in the hearts and the aortas of animals subjected to the same experimental protocol (21), further illustrating the unique capacity of the kidney to undergo rapid remodeling. The present study provides stereologic documentation, but it fails to provide mechanistic insights. The study of Nakamura et al. (5) showed that PAI plays a major role, and more detailed cellular and molecular analysis is certainly warranted to work out further details. The present protocol led to a substantial decrease in BP after delayed enalapril treatment. This causes an interpretational dilemma whether reversal is a specific effect of ACE inhibition or whether it is a nonspecific result of BP lowering. Experiments to clarify this point are currently underway and will be important when one considers translating these findings into treatment strategies of renal patients. This research has been supported by a Marie Curie Fellowship of the European Community programme: Improving the Human Research Potential and the Socio-Economic Knowledge Base under contract number: HPMF-CT-2001-01501. This research also has been supported by DFG (SFB 423, project B8). The authors thank Z. Antoni, A. Bönisch, G. Gorsberg, P. Rieger, and H. Ziebart for excellent technical support and G. Odoni for help and advise with the surgical technique. Is Regression of Chronic Nephropathies a Therapeutic Target?